1. How did The New Craftsmen come to be? The New Craftsmen was was founded in 2012 by Mark Henderson, Catherine Lock and Natalie Melton. Their ambition was to refine and redefine craft in the British Isles; elevating it in the luxury sphere; and providing craft makers with effective means by which to access markets, audiences and opportunity. We started with two pop ups - the first was opposite the Connaught on Carlos Place and the second was in an old Victorian stable on Adams Row. The response and the appetite we received from both was enough to demonstrate to us the need to formalise this into a business. In 2014 we opened our showroom in a former Victorian breeches factory in Mayfair on North Row. The showroom is a dynamic space steeped in the narrative of making and process - we wanted a space which allowed people to engage not just with the object but with the people behind them, and consequently value their work in an entirely new way. Within these walls collectors, clients, collaborators and customers can connect with the work on their own terms. We realised that an important aspect of our business was working with interior designers and architects on bespoke projects and orders. In 2016 we opened the Studio - a complete material and sample library of the makers we work with to allow trade clients to understand the commissioning potential of different makers. This has grown into a thriving service & product offer. We have also had the privilege to work with the likes of Burberry (2016) and Selfridges (2017) on incredible creative projects which have seen the skills of our makers unleashed to creative entire environments and installations. We are constantly searching for new opportunities where the creative expression of our makers can be applied and shine. We love a challenge and the imagination really is the only limit. 2. What is The New Craftsmen's ethos? For us it's so important that these values comes to life in our day-to-day - how we conduct ourselves internally, how we work with our makers and clients, and how customers experience us as a brand and business through every single touchpoint. 3. How do you choose who to collaborate with/stock? Our Creative Director, Catherine Lock, has incredible creative instincts. This is then also paired with commercial nouse and market knowledge - what do people need and what are they looking for? We work with makers who embrace and embody our values; who are willing to experiment and try something new; who are interested in seeing their work used and appreciated in everyday ways; and have a deep connection to narrative, material and process. From a trade perspective, we want to work with those makers that are willing and have the appetite to collaborate - to apply their craft and materiality to a different context or product category - which is important for when working with interior designers and brands. 4. Tell us about the current luxury craft landscape in the UK. Is it changing? And why is it important? The talent and work emerging in the craft landscape in the UK is really exciting - taking traditional and new materials, blending old and cutting edge practices, or rediscovering and reinventing forgotten processes. And it's not just coming from young, hungry graduates but also experienced craft makers who have been honing their practice for years. The perception of 'craft' is also changing dramatically - gone is the dusty connotation and it's being seen as a creative paradigm in its own right rather than the poor sister to 'art' or 'design'. Really, all three are working in tandem and are being embraced as such. But this success in the market is still under threat by barriers to education and opportunity. The lack of funding in craft education is a significant issue and needs to be addressed; or we run the risk of putting off the next generation of creatives from following this path because they don't see it as leading anywhere sustainable. 5. Current product highlights at The New Craftsman? 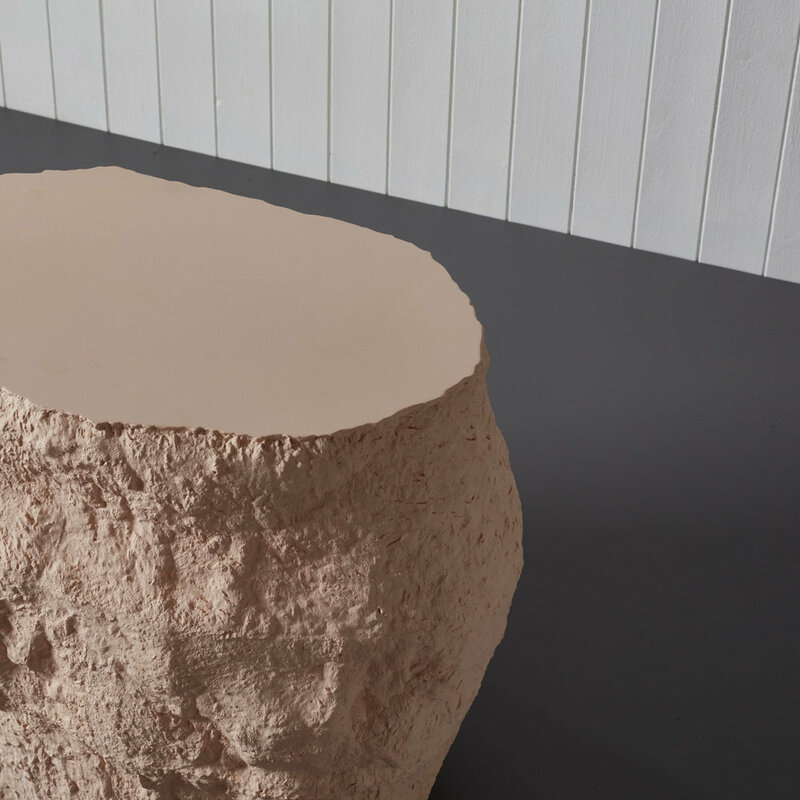 The Buoy light by Akiko Hirai - traditionally a potter who makes exceptional tableware, but we wanted to take that signature texture and style to create a light from it. The Buoy light is made from hand-turning two separate pieces on a potters wheel and is intensive work. We are now launching smaller versions of the light which would look great above a dining table or in restaurant. Acacia Side Table by Malgorzata Bany - the clean sculptural lines of the work by Malgorzata Bany are beautiful and very popular with interior designers. I love the organic quality of the Acacia side table, and its pinky hue. Paper Collages by Jo Waterhouse - Jo Waterhouse's art work is both joyful and playful. Inspired by English folklore tradition and the realms of her imagination, this series of pieces would work perfectly in a children's bedroom. Vessels & 'Sienna Mobile with Gourd' by Daniel Reynolds - Daniel creates amazing oversized, ceramic 'pots' which add drama and scale to any interior. His mobiles are also incredible - adhering to a simple colour palette of black, white and cream, his mobiles creates paired back aesthetic prioritising texture, pattern and form. Viewpoint by Nicola Tassie - with this extraordinary piece, Nicola is elevating our idea of 'tableware' and challenging how we use and display it in our homes. 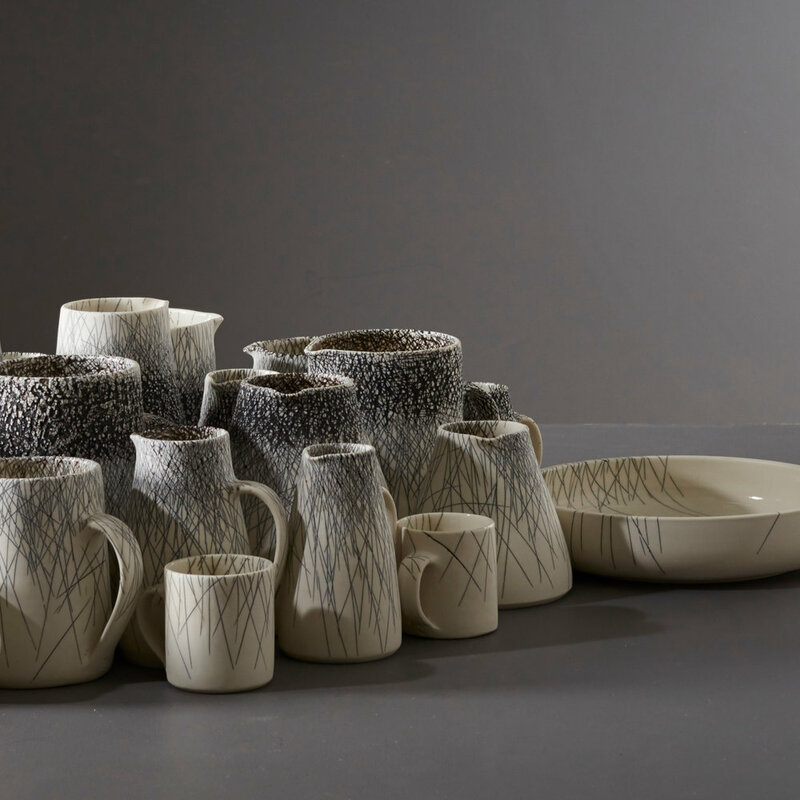 'Viewpoint' is a presentation of 35 precisely arrange and decorated porcelain vessels that explore the relation between function and form; each individual piece is in-laid with black lines that align across the whole composition. 7. You're well known for creating great events, any exciting plans for the future? London Design Festival is just around the corner - we're transforming our showroom into a fully functioning canteen from Saturday 16 to 23 September (closed Sunday) to launch our new furniture collection - COMMON PARTS. The canteen will play host to an exciting programme of debate, discussion, and gossip - all centred around the social and cultural power of craft in today's world. Anyone is welcome to drop by! 8. What does your own house look like? I'm very fond of my little flat in Stoke Newington, which is the first place I've ever owned. Even though it's tiny, I've tried to be as efficient with the space as possible and worked a lot at the beginning to make it feel larger and let in more light. Style-wise, I'm very influenced by how my Swiss grandparents did their home and the style I was surrounded by growing up - which was generally a 'curated' mess of things from travels, memories, knick-knacks, clutter and 'things'. All my furniture is vintage or found which I've either painted or ruined; I have a thing for ceramics so they clutter up the shelves along with a lot of books! I recently started buying the odd bits of art - nothing flash, just things I've stared at for a long time and couldn't quite walk away from. Safe to say, it's homey.